“Everyone doesn’t have to agree with my dad or like him, but I do ask you to be decent and respectful. If you can’t do those two things, be mindful. 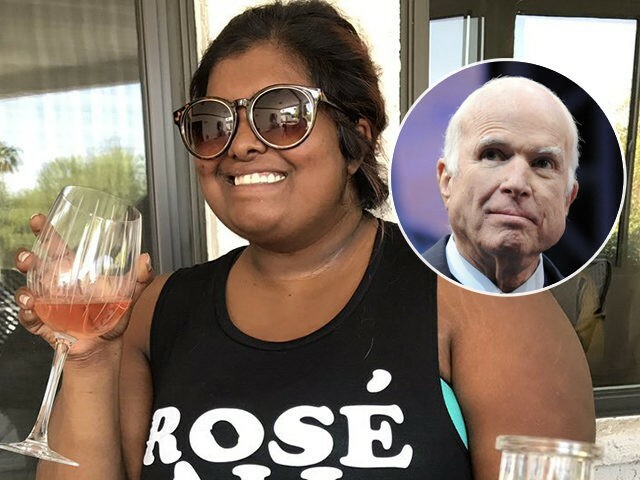 We only said goodbye to him almost 7 months ago,” Bridget McCain, an Arizona State University graduate adopted from Bangladesh, tweeted directly at President Trump early Thursday morning. President Trump did not receive an invite to McCain’s Washington, D.C., funeral, while both former Presidents Barack Obama and George W. Bush eulogized the longtime lawmaker. Remarks from both Bridget and Meghan come as President Trump and the McCain family have faired up once again. Over the weekend, the president criticized the late lawmaker’s involvement in handing over the largely discredited Steele dossier. “I’m very unhappy that he didn’t repeal and replace Obamacare as you know, he campaigned on repealing and replacing Obamacare for years,” he added. “And then he got to a vote and he said thumbs down.